Automation is not new and the human race has witnessed or witnessing automation in all spheres of life on a daily basis. There is always a betterment/advancement in the products and services we use. We have been silently witnessing the automation over the years. Robotic Process Automation (RPA) is a big leap in the automation of business processes. It’s being used for high volume repetitive work, which are currently done manually. These are generally rule based and humans are trained to perform tasks on a regular basis. RPA is a process in which Robots are trained to perform rule based repetitive tasks. The work flow, algorithms, business cases are programmed to perform tasks. The training includes creating a flow chart, process defining rules, data enrichment, reporting features etc. Once the process is defined the robots will produce required results in 1/20th speed of humans. RPA can bring in higher efficiency, faster processes and at a reduced cost. In general any business process with standard rule based tasks can be automated. It’s advisable to automate high volume jobs to justify the costs for setting up the RPA systems. 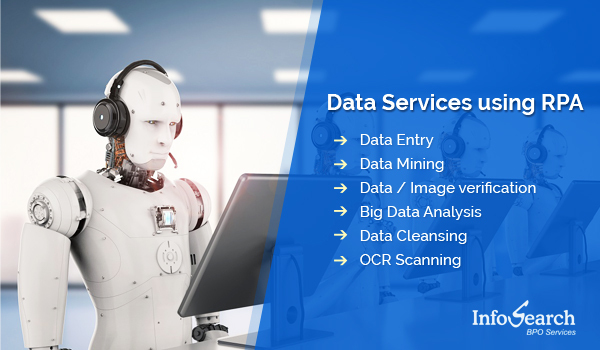 Some of the common tasks are data entry & conversion, data mining, data extraction, Image recognition, accounting and financial functions, banking processes etc. The technology is in the nascent stage and 100% automation of all business processes may not be possible. It requires human supervision, support to perform knowledge based tasks which needs judgemental skills. We have been providing RPA enabled BPO services to our clients. We bring in technology and human skills to execute our clients’ projects. Please write to us to know how we can automate your business processes.